One of the major contributions to the cost of a fuel cell vehicle is the cooling system. This is because the fuel cells in the fuel cell vehicle prototypes released by manufacturers so far are mostly LTFC, or low temperature fuel cells. In fuel cells, the membrane temperature can operate at a maximum temperature of approximately 80 degrees Celcius. If the temperature exceeds this value by a considerable margin, fuel cell performance breaks down and irreparable damage is done to the cell. Volkswagen Research has developed a new type of high temperature fuel cell, or HTFC, which uses newly designed electrodes which can be driven at temperatures of up to 160 degrees Celcius at the same amount of power, though a medium operating temperature target of 120 degrees is intended. This means a simpler cooling system is sufficient, thus reducing the cost, weight, and space needed for vehicle fuel cell systems. 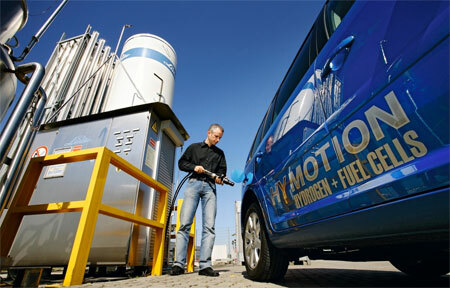 Volkswagen expects fuel cell drive vehicles that use HTFC drives could appear by the year 2020. They see no chance for mass production of LTFC vehicles due to fundamental disadvantages in their design.